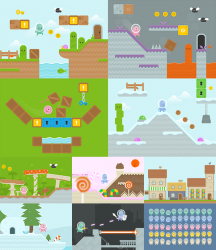 Package which includes the Platformer Art (Deluxe) base pack and ALL expansions in 1 easy package, updated often to include the newest tiles. Kenney I'd actually been considering doing this recently, but I got hung up in implementation. Please consider everything below constructive criticism / insane rambling. It's the directory structure that throws me off. This structure that you've made isn't really unified, it's as if I downloaded all the packs myself and extracted them to separate folders, which saves me a few minutes of time, but in a pack like this I'd want a unified folder structure. I've actually spent over a week trying to come up with such a structure, to no avail. Maybe you can help me come up with one? I'll describe the logic I've gone through to get to this point, and please bear with me. I'm very OCD about structure when I'm programming something. I like things to be consistent so I can find things easily. 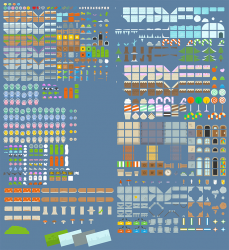 The first thing I did was try to find some commonalities in the Platformer Deluxe pack, because in that pack, everything is in two gigantic folders, "Tiles" and "Items". I noticed in the red square that these were fairly easy to sort. It's the green square that threw me off. There was no rhyme or reason to these things. The second thing I tried to do was decipher your original structure, what makes a tile a tile, and an item an item? 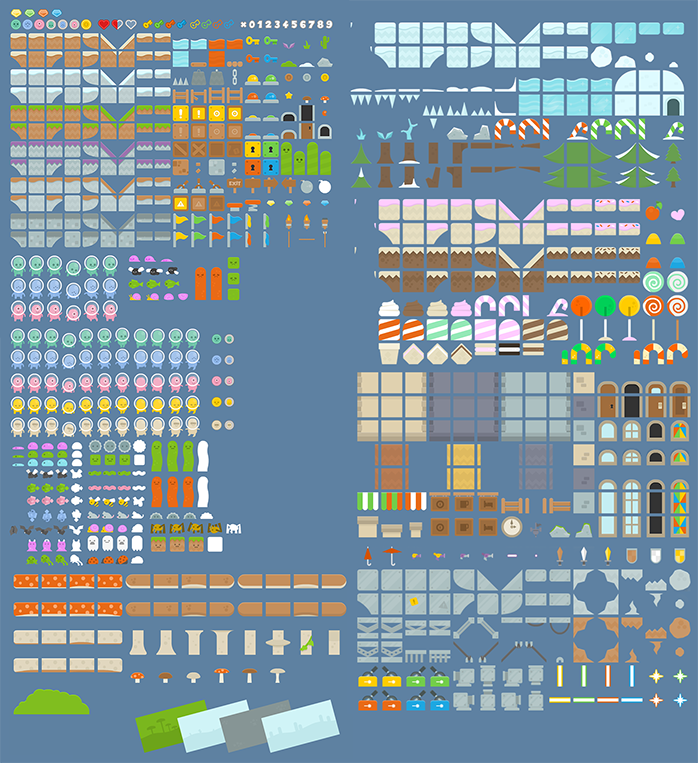 I assumed it had to do with the size of the image, 70x70 for tiles, other sizes for items. This did not pan out, as I found irregularities. The third thing I did was dump everything in the items folder into the tiles folder, as I couldn't find any difference between the two folders, and then I started to separate them by logical connections. The "biomes" folder had everything in the red square sorted by biome, which made it easy to add those segments "tundra" "cake" etc from your expansions, in a consistent manner. So far I've sorted the things in the green square by purpose. Interactive, Decorative, in interactive: mechanisms, collectibles, etc. Something feels off about this structure as well though, when I get to things such as the candy canes in the tundra set - are these decorative or should I put them in the biome->tundra folder? What are your thoughts on this? I think if there is a main "everything" pack, it should have a unified, sorted directory structure that makes sense, but I'm still working on that. It is probably a pointless waste of time, but whenever I use your work I want the project layout to be perfect. Is in your plans to do a plain attack animation, that one could use with all your items? And even one just looking up, that could be use also used to shot/throw upward? Kenney, I think you may have forgotten to include the backgrounds in the pack. Thanks for all your work! They're amazing! It's soooo cool! Keep up with the great work! 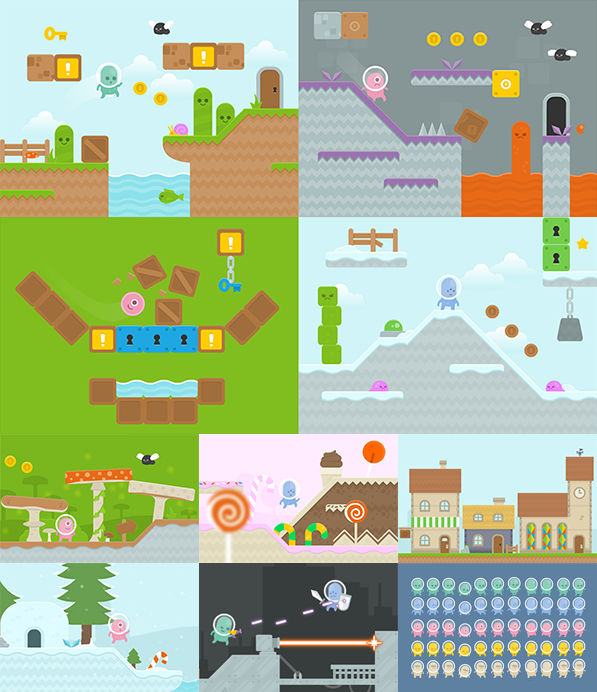 I used this art to make Candy Ninja for the Candy Jam, guide is in the main menu. Facebook login is not required, it's for the scoreboard only. And it looks like a lot of other entries did also. I think it's awesome you donate such high quality work to the public domain. I'll be going through the images I modified and try to upload them to this site sometime soon in case anyone else finds them useful. Russpuppy said it best. Kenney, you really are a indie programmer's best friend. I literally look forward to your work. Even if I have no personal use for them, it makes me feel great that people like you are really helping programmers everywhere fill in a huge void and setback in their careers; high-quality graphics, and on top if it they're free. You are gift from god, for all of us. Thank you. I wrote this on Twitter, but I also wanted to post here. A HUGE thanks to Kenney for his wonderful assets. I used them to create my newest app - Martian Mix-Up! I hope I've done your fantastic work justice, and please keep up the great work! I can't wait to see what you do next. Thank you. I'm just starting out and having free awesome art is...well, AWESOME! Hey, if I want to import the full tileset into Tiled, what settings should I do for spacing or margin? I have tried a few times, and can't get it to format the tiles correctly. Any help would be awesome! It's just a training project so it won't be seen elsewhere, but your free resources were a big help! I have looked high and low for the assets i had downloaded months ago i wanted to use, to no avail. I can't get the walking sprite to work, it just looks really damn weird. What in heavens name am I doing wrong, i used the sprites from the spritesheet however it doesn't work very good. What am I doing wrong?